Daphne Caruana Galizia's killers can run but they will never be able to escape God's justice, Archbishop Charles Scicluna told mourners at her funeral this afternoon. "We still do not know who killed Daphne," the Archbishop told a packed Mosta church. "However hard you try to evade from the justice of men, you will never escape from the justice of God," he said. "Repent before it is too late." 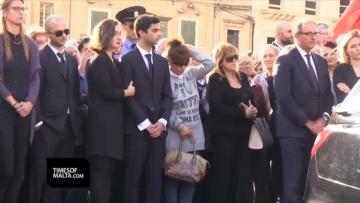 Ms Caruana Galizia's funeral comes two and a half weeks after she was murdered in a car bomb attack just metres away from her home in Bidnija. People began filing into the church shortly after 1pm today, and before long the pews were filled with mourners there to pay their respects. Among those present were president emeritus Eddie Fenech Adami, former prime minister Lawrence Gonzi and former PN leader Simon Busuttil. Chief Justice Silvio Camilleri was also spotted. European Parliament Antonio Tajani was also present on the family's invitation, and OSCE media freedom representative Harlem Desir was also among the congregation. President Marie-Louise Coleiro Preca, Prime Minister Joseph Muscat and Opposition Leader Adrian Delia were conspicuous by their absence. 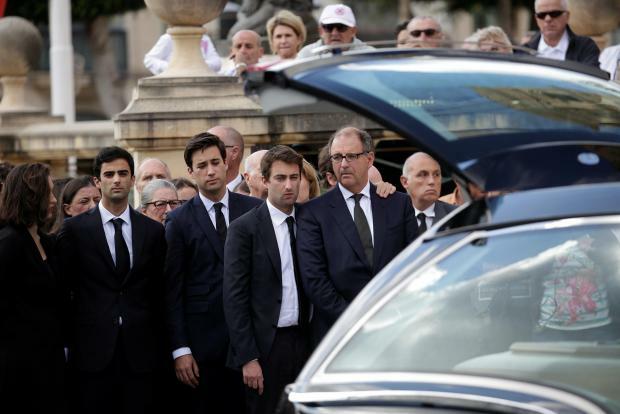 Spokespersons for the President and Prime Minister yesterday confirmed that the Caruana Galizia family had told them they were not welcome at the funeral. Dr Delia was also nowhere to be seen, having seen a public apology to the family slapped away by Ms Caruana Galizia's sister just last week. 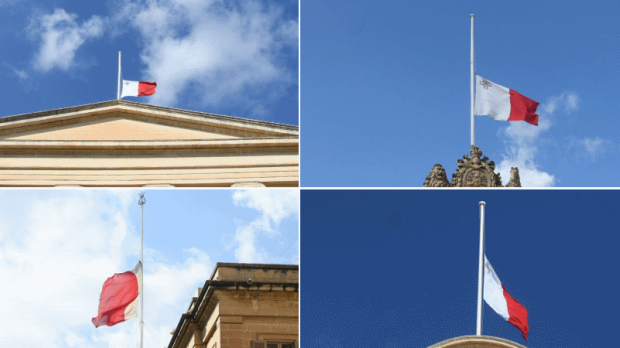 Flags on all government buildings as well as the law courts are flying at half mast today, following the government's decision to call a national day of mourning. That gesture was mirrored in Brussels, where European Union flags outside the European Parliament and Commission buildings were also flown at half mast. In a statement issued this morning, EU Commission first vice-president Frans Timmermans said "the eyes of Europe are on Maltese authorities" as he cranked up pressure for investigators to get to the bottom of the murder case. 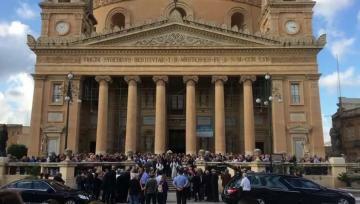 Times of Malta did not shoot any footage or photos inside the church during the service, in line with the family's wishes. The burial is being held in private. 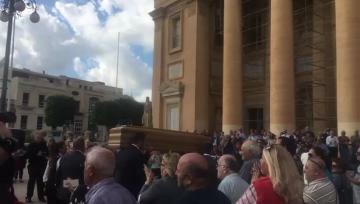 3.35pm The funeral cortege is now snaking past the crowd and away from the Mosta church, to the private burial. 3.32pm An emotional crowd belts out the national anthem as they hold their hands up in the 'V' gesture universally recognised as a sign of peace. 3.25pm Huge crowds outside the church now, and eyewitnesses say some of those present are calling out for justice for Ms Caruana Galizia. 3.15pm Applause reaches thundering levels as the casket is carried out of the church and to the funeral hearse. 3.10pm The funeral service ends with the Archbishop reading out a statement from Pope Francis, who expressed his condolences and sent his blessings to Malta. The congregation applauds. 3pm Church bells toll as the funeral service draws to a close. People have gathered outside the Rotunda as they wait for the funeral cortege to emerge. 2.45pm Archbishop Scicluna urged Ms Caruana Galizia's three sons to be strong and ended his homily on a unifying note. "I pray that the hard and contemptuous words with which we demonise and denigrate each other cease once and for all." 2.40pm Strong words for Ms Caruana Galizia's killers from Archbishop Charles Scicluna, who is leading the service. "We still do not know who killed Daphne," he told the congregation. "However hard you try to evade from the justice of men, you will never escape from the justice of God," he said. "Repent before it is too late." 2.25pm There have been a series of vigils and protests following Ms Caruana Galizia's murder, with activists calling for the police commissioner and Attorney General to resign and protesting at what they say is the breakdown in the rule of law. The Civil Society Network, which held two of the larger protests, has said it will stage a sit-in outside police headquarters in Floriana this coming Sunday. Ms Caruana Galizia's casket is carried into church. Women from the #OccupyJustice campaign are due to meet with the Prime Minister next week, but have said they intend to keep up the pressure. 2.20pm Ms Caruana Galizia's funeral comes one day after the UN-designated International Day to End Impunity for Crimes Against Journalists. She is one of 44 journalists killed this year alone. Over the past 11 years, more than 900 journalists have been murdered, the UN has said. 2.10pm People as far away as New Zealand are in mourning: a vigil in memory of Ms Caruana Galizia was held in Auckland. "New Zealanders owe a huge debt of gratitude to Daphne, who twice 'blew the whistle', using Panama Papers information exposing how NZ 'Foreign Trusts' were being allegedly used for money- laundering, by Maltese 'Politically Exposed Persons' (PEPs), at the highest levels," organisers wrote. They've uploaded a video of the event. 2.08pm It's not just in Malta that flags are flying at half mast: European Union flags outside the European Commission have also been partly lowered. 2.05pm Ms Caruana Galizia was brutally murdered more than two weeks ago, in an assassination that shocked the world. Her killing has drawn condemnation from all quarters, and the European Commission today upped the pressure on the Maltese government to find her killers. 2pm The church is packed to the rafters and people arriving now are being turned back. 1.55pm Journalists were told they "should be ashamed of themselves" by mourners as camera shutters clicked when the coffin was lifted out of the hearse. 1.50pm People applauded as Ms Caruana Galizia's casket was carried into the church.